Now here's a game I think most of our readers would have played or heard of throughout the years, is Jet Set Willy. A platform game originally written by Matthew Smith and published by Software Projects for many home computers such as the ZX Spectrum in 1984. It star'd none other than Miner Willy who is tasked by the housekeeper Maria with the cleaning up of items left around the house after a big party. So why are we mentioning that classic game? Well today's news is something special, as thanks to a heads up via our twitter page, we have come across a rather interesting online game(s) called 'Super Spectrum World' by Stephen Smith! Why is this rather special you might ask? 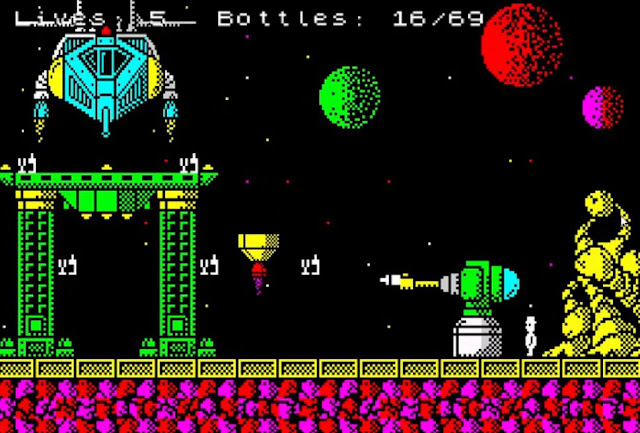 Well in this rather unusual ZX Spectrum inspired online banaza, you play through a "Jet-Set-Willy-style" experience through the maze of Spectrum-themed screens, collecting as many bottles as possible. Which pretty much means through every screen of finding bottles you will relive classic games of our youth such as R-Type, Chuckie Egg and even Dizzy, but in the style of Jet Set Willy playing Mr Willy himself!